A reminder: Julian Gollop, of the Gollops what made X-Com, is currently creating a follow-up to his wizarding strategy game Chaos. It's called, somewhat inevitably, Chaos Reborn, and several months ago it narrowly hit its funding target on Kickstarter. Now, a new trailer has been released showing how far the colourful, turn-based, roleplaying magic-'em-up has come in the last couple of years. The video also reveals the date we can expect it to wash up on Steam Early Access—and it's probably sooner than you think. 'December 9th' is the date to etch onto the side of your wand (writing it in your diary would likely help as well). 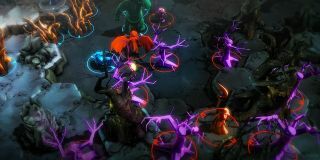 The Chaos Reborn site has a wealth of information about the game, which mixes single-player tactical roleplaying with "multiplayer arena wizard battles", four words that look beautiful together. The above video certainly looks the part, boasting all sorts of fancy animations and visual effects that look quite striking next to the flat developer art we were looking at almost exactly two years ago.